Establishing comparative Trade Volumes in the Barter Industry is a challenge. This graph is my best estimate derived from information researched while conducting my investigation into the Ormita fraud. 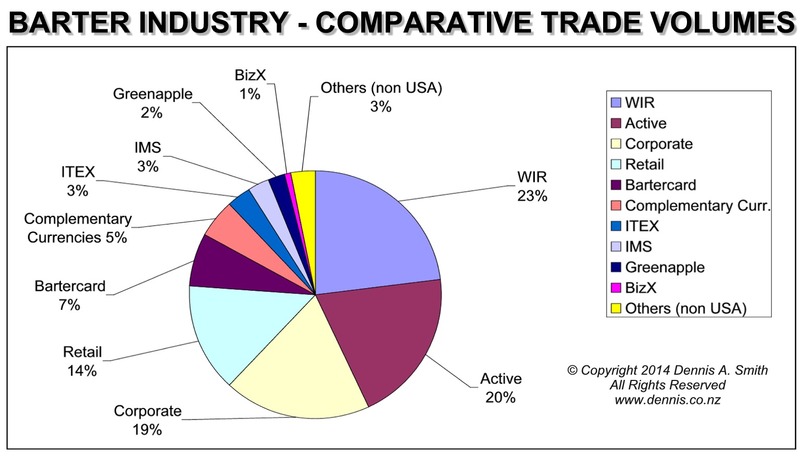 The graph represents approximate industry Trade Volume ratios as at 2013. It is a little North American-centric (it excludes some substantial players outside of the USA), but is a good guide nonetheless and certainly the only one I can see out there at present. An issue with developing an overview like this is what criteria we set to define the ‘barter industry’. 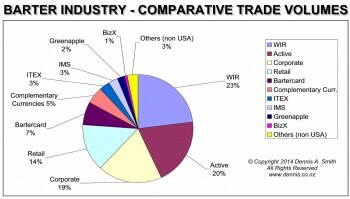 I’ve taken the position that the pie chart embraces ‘barter systems’ that comprise the ‘barter industry’. This excludes one-on-one swaps/trades and counter-trade. If we added all the one-on-one trading out there – the number would be massive – but a child trading his baseball cards for an iPod is not part of the “barter industry,” – bartering systems that have either a third party element clearinghouse element and/or an alternative currency debit/credit system. Another issue is that some operators jealously guard their trading figures. Some also inflate their figures to include a single transaction twice (buy/sell or debit/credit). I developed the graph here with the assistance of Ron Whitney (IRTA) and others. Thanks for their advice. a link to www.dennis.co.nz if it is a web resource. That way I can also inform you of updates as they occur. The laws of genetics are not friendly to evolutionary theory.